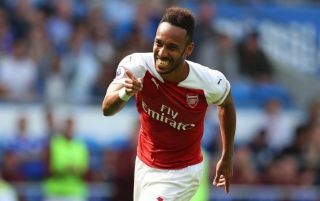 Arsenal striker Pierre-Emerick Aubameyang scored from outside the box in the 3-2 win over Cardiff City today – the first time he’s done that since March 2016. The Gabon international joined Arsenal from Borussia Dortmund in January and has looked a real hit for the Gunners due to his penalty box poaching instincts. One of the most prolific strikers in Europe during his time in the Bundesliga, Aubameyang is certainly impressing in England as well, though it’s fair to say he doesn’t score much of a variety of goals. The best strikers can usually mix it up a bit, so Gooners will be glad to see their front-man showing such superb accuracy and technique from outside the area this afternoon. The last time Aubameyang scored from long range like this was during his Dortmund days over two years ago, in a Europa League game against Tottenham. That’s quite a long wait, but thankfully the run is now over and he’s showing Arsenal fans the full range of his talents.